The lone standing Douglas Fir symbolizes endurance, defiance & resilience against fire, flood, catastrophic change & even against the anthropocentric Man. All these symbols of color & icon come together to symbolize what being Cascadian is all about." In a statement released, the Cascadians Against Hate Coalition stated that it "does not promote, permit, or condone any behaviors or actions of a sexist, racist, derogatory, or discriminatory nature . . . Moreover, we outright condemn all hate groups, their actions and ideas, as they run contrary to the core Cascadian bioregional beliefs and tenets. These groups threaten to undermine the sacred relationship between biodiversity and nature, which is the crux of life." We want to see your Cascadia flags fly! Any doug flags flying, hanging, stuck, sewn, painted, or however you show your bioregional pride can be a part of Doug Flyin' Friday (#DougFlyinFriday) each week! Wishing you a wonderful, historic, Cascadian Pride weekend! A wonderful message from all the staff at the People's Harm Reduction Alliance wishing everyone in Cascadia a wonderful Pride Weekend! PHRA one of the largest peer run, needle exchange programs in the country. 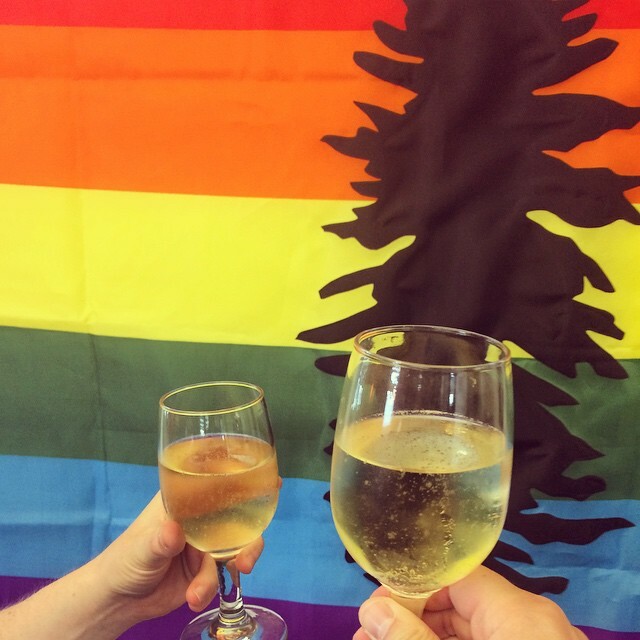 Cascadians everywhere celebrated the historic ruling by the Supreme Court last Friday that states could not block the universal rights for two consenting adults to marry. Below are just a few of the wonderful pictures sent in. Recently featured at several Timbers, Thorns and Seattle Reign matches, Camp Cascadia, as well as at both Seattle and Portland pride celebrations, the Rainbow Cascadian Doug Flag is becoming a common site and is a way to show Cascadian solidarity with ongoing efforts for human equality. 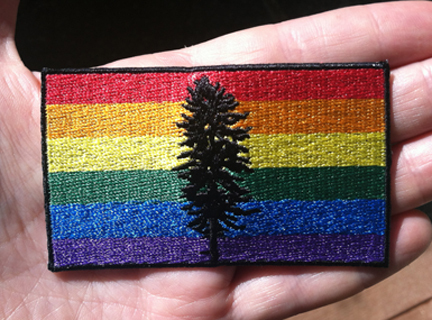 The Douglas Fir Cascadia flag patch, in the rainbow colors of LGBT Pride or the international peace flag are now available for $3.00 each or 4 for $10 and all orders come with free shipping! 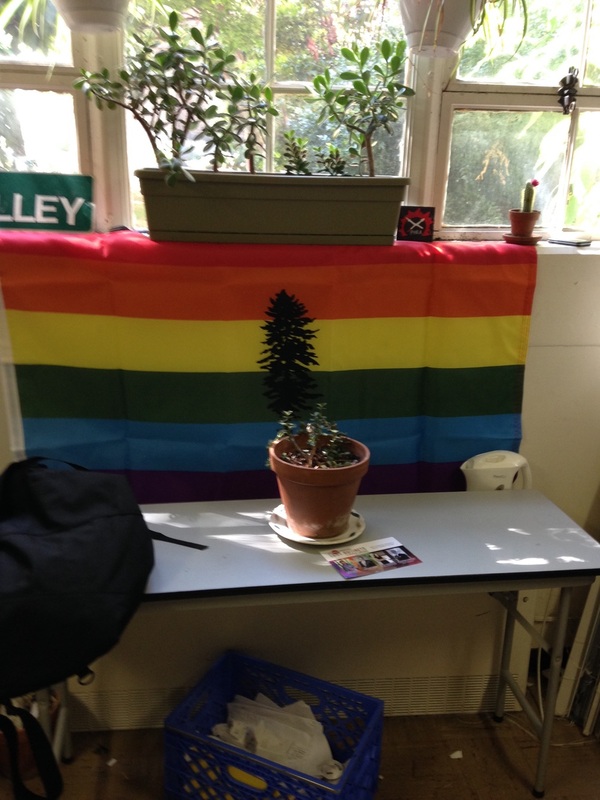 They feature a Douglas Fir tree ('the Doug') in front of a rainbow colored stripe. They are also available for purchase with the muted Cascadian Doug patches. If you want both kinds of patch, just place the orders separately and they'll be shipped in one package. Free first-class shipping for all US and Canadian order and allow up to two weeks for orders, though it probably won't take that long. Some would say that Soccer in America is defined by the support of the game in the Pacific Northwest. This scarf was designed with the mission of showing your pride for Cascadia and keeping the cup. The rivalry between Seattle, Portland and Vancouver is a rivalry unlike anything else in American or Canadian Soccer. These scarves are sturdy, well made, nice and long and absolutely perfect for guarding your lungs from flare smoke.